What makes an approach both sustainable and successful? That topic is explored in our fourth issue of Inspired, a quarterly publication for all Montefiore associates that provides an in-depth look at what is happening across our growing and dynamic organization. This issue's theme focuses on sustainability and how Montefiore became a national model for diabetes management. We also discuss going green, social media, and new ways of learning. 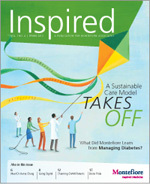 Be sure to check back www.montefiore.org/inspiredassociates for the latest issue, as well as new videos and other updates. Andrew D. Racine, MD, PhD, discusses an initiative of Montefiore Medical Center to bring much-needed technology to the Dareda Nursing School in Tanzania. The Wildlife Conservation Society hosted the Fourth Annual WCS Run for the Wild at the Bronx Zoo. Montefiore Medical Center was on hand to support the event and spread the word about healthy living in the Bronx community. The Wildlife Conservation Society works across Africa and in the native range of lions in places such as Queen Elizabeth National Park, Uganda, and Nigeria's Yankari National Park. Of the 30,000 lions remaining in Africa, nearly half of them are in Tanzania and only 2,000 lions remain in Kenya. Kenya is losing 100 lions -- 5 percent of the population -- every year due to habitat loss and human conflict. WCS educates local people about how to live with lions and teaches ranchers techniques that keep cattle and lions away from each other. Joel Zonszein, MD, CDE, FACE, FACP, discusses Montefiore Medical Center's multidisciplinary approach to treating chronic diseases like diabetes.